Place the squash, open side down on a cookie sheet and bake for 30 minutes. Remove from the oven, check to see if the squash is soft and easily comes up with a fork into a spaghetti like texture. If it’s too hard to remove, cook for another 10 minutes. Remove from the oven, scrape and fluff the stringy squash with a fork. Leave the squash in the skin. Turn the oven up to broil. Add the tomatoes and fresh basil into the squash, stir and top with the mozzarella cheese. Place in the broiler for 3-4 minutes, until the cheese is melted and slightly browned. Allow to cool for 5 minutes before serving the squash. 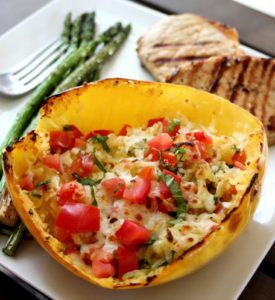 There are many other recipes for spaghetti squash over the Internet, this one came from here. Thanks to Debbi Ascher for showing this to us.